-As much noise as was made about voters being mad at Washington this year, they actually react more favorably to their Senators than they do their Governors. The average Gubernatorial approval rating is 42% with 45% of voters disapproving. The average Senator was actually in net positive territory at 43% approving and 40% disapproving. 12 Governors have positive approval numbers, 16 have negative ones, and 2 split right down the middle. -It's good to be from a small state. The six most popular Governors we polled on this year all came from places with seven electoral votes or less. The most popular by a wide margin, although he isn't a Governor anymore, was Joe Manchin at a +48 approval spread (70/22). The others near the top of the list are Bobby Jindal (+24), Jodi Rell (+24), Brian Schweitzer (+22), Jack Markell (+18), and Sean Parnell (+16). -Four Governors ended the year (and their terms) in the under 30% approval club. The least popular in the country at least in our polling is Arnold Schwarzenegger at a -38 spread (25/63). The other folks reaching this unwelcome unpopularity level are Bill Richardson at a -37 spread, Jim Gibbons at a -36, and John Baldacci at -29. It's not a coincidence that 3 out of 4 of these guys saw the Governor's office in their state flip to the other party last month. -Here are numbers on some folks who will or might be on the ballot during the 2012 cycle: Kentucky Democrat Steve Beshear who's up next year is unusually popular at a 48/34 spread. So is Missouri Democrat Jay Nixon, up in 2012, at 44/30. North Carolina Democrat Bev Perdue, also up in 2012, falls on the wrong side of the approval averages at 35/44. Linda Lingle of Hawaii, who Republicans are hyper about as a potential 2012 Senate candidate, is not nearly as popular as she may have once been with voters only narrowly rating her favorably at 46/45. -As was the case with the Senators there's not a huge difference in the popularity of the Democratic Governors vs. the Republican ones. The average Democratic Governor approval spread is 41/46. For the Republicans it's just slightly better at 44/45. It sure would be great if you could poll incoming Governors to get baselines for them. Jodi Rell should be listed as a Republican, not a Democrat. Jodi Rell is a Republican, not a Democrat as you indicate in your table, FYI. Thanks to everyone for catching my typo. Jindal's popularity is more a comment on the State of Lousiana and its voters, than on Jindal. Many people in Louisiana are precisely like our "Tigers for Jindal," here at LSU in Baton Rouge. People who are not quite sure of what is going on often vote for the politician less likely to help them at all. Sad but true. 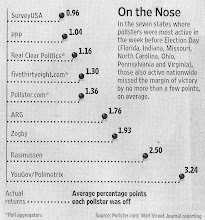 This explains Jindal's so-called popularity in the the state we live in. Gov. Jindal may be +24, but he is losing momentum FAST! His approval rating has dropped 12 points (from 70 to 58) just in the last several months. Louisiana is facing a conservative $1.6 billion shortfall next fiscal year, and Gov. Jindal has remained silent on how he may address the issue (aside from offering the equivalent of garage sales by selling prisons, future lottery proceeds, etc.). Why would Gov. Arnold Schwarzenegger go from raging popularity to -38? Budget issues! Furthermore, it's been my experience people are FAR more motivated to vote AGAINST a candidate than they are to vote FOR a candidate, so you can bet that 34% negative rating for Jindal is SOLID, but just how solid is the 58% positive rating in turns of those people showing up on election day? I'm a life-long Republican who voted for Jindal before, and I am SORELY disapponited! The people of Louisiana don't like being viewed as mere nuisances that a Governor had to deal with while he pursues a higher calling. My voting record is near 100% (I don't even miss minor tax millage elections), and I can tell you I will have to be in a coma before I fail to go into that voting box and vote FOR whomever else is on the ballot OTHER THAN incumbent Gov. Bobby Jindal! Of course, my hope is that his ego gets the best of him and he declares for President next year. Then there's no way he'll be Governor of Louisina another four years! "It sure would be great if you could poll incoming Governors to get baselines for them." As I said in the Senate thread, we have been, but you can't include them in the same chart, for one, and soon enough, they'll actually be in office, so we'll be polling their actual approval ratings. It's almost January. Louisiana has more than 7 Electoral Votes.